This post is part of our ongoing series exploring the millions of previously-secret tobacco industry documents now available on the Internet. – Ed. “Project SCUM” was R.J. Reynolds’ plan to increase sales of Camel cigarettes in the San Francisco area by marketing them to gay people in the Castro district, “rebellious, Generation X” -ers, people of “international influence” and “street people,” by introducing Camel cigarettes into less-traditional retail outlets like “head shops.” SCUM was an acronym that stood for “Sub-Culture Urban Marketing.” RJR’s rationale for the project was a higher incidence of smoking and drug use in these subcultures. 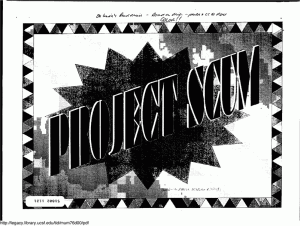 There are several versions of the “Project SCUM” document, ranging in dates from 1995-97. Each offers revealing marginalia (handwritten markings on the page). For example, in one document, handwritten in next to a bulleted list of consumer subcultures are the words “Gay/Castro” and “Tenderloin,” referring to gay areas of San Francisco. Next to a list that discusses the rationale for the program, a line says “higher incidents of smoking in subcultures” and has the phrase “and drugs” handwritten in. On yet another copy, the phrase “and drugs” is crossed out, revealing RJR’s ambivalence about their exploitation of the drug culture. A later copy of the document’s title page has the word “SCUM” crossed out and the word “Sourdough” handwritten in, as though RJR realized too late the derogatory name they had slapped on their customers. See a copy of RJR’s Project Scum document here. Great idea and great name. Scum is very fitting.